For Dr. Al Simoncelli, a bad car accident led to good fortune. While attending college as a design engineer student, he was involved in a rear-end collision. Suffering a rear impact at 65 miles per hour, his fourth and fifth lumbar vertebrae were left fractured. Although doctors said he would experience pain indefinitely, a co-worker would be the one to heal him. Dr. Simoncelli admits his co-workers suggestion to visit a chiropractor was a novel idea to him in 1979. She offered him a chiropractic book explaining how bodily mechanics are associated with the nervous system. Dr. Simoncelli found a passionate doctor who was able to alleviate back pain and even headaches prior to the accident shortly after his chiropractic treatments. His experience led to a revelation, prompting the design student to switch gears. He attended a premed program at Bloomfield College and graduated from Cleveland Chiropractic College in 1988. Mountain West Chiropractic treats a broad range of ailments. 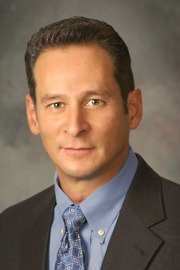 In 1991, Dr. Simoncelli founded Mountain West Chiropractic in Las Vegas during a booming economy. His rehabilitation facility treats patients for a broad range of ailments, including scoliosis and personal and sports injuries. “You can put all the oil you want into a bent hinge, but it will not improve the hinge until you unbend it.” says Dr. Simoncelli. He feels improving bad posture is the key to a healthy back. The chiropractor truly enjoys the challenge of adjusting postures and enhancing patient health, citing that reported improvements in sleep patterns or mobility are signs that the body is beginning to heal. Mountain West Chiropractic follows a unique structure-based approach for chiropractic treatments. Dr. Simoncelli believes that “improved function always follows improved form”. The practice focuses on improving and correcting abnormal postures to reduce any onset problems and to achieve greater, long-term results. Utilizing the ” mix fix set” protocol that emphasizes chiropractic exercises and neuromuscular reeducation to first, increase flexibility of the spine; second, make corrections; and third, strengthen areas around the corrections. Since scoliosis in young children can often he left undetected Dr. Simoncelli suggests a simple home test to check for possible indications. While the child is leaning forward and touching their toes, check their back and rib cage for any abnormalities such as a twisted torso. A family man, he and his wife Sheryl have two boys, and one girl. Dr. Simoncelli is also an avid photographer. He also enjoys reading current literature and research on nutrition, fitness and public health issues. Thanks for visiting our site. Looking forward to meeting you in person and learning how we may be of service to you. Give our Las Vegas office a call, or click here to email me and let’s arrange a time to explore your options.